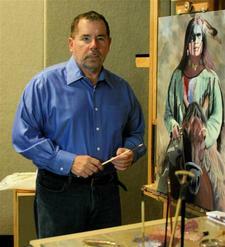 John Yaeger is considered today to be one of the foremost and finest artists of Western art. His passion for art and painting evolved from an early age. His love of the Native American came from his introduction to their culture and lifestyle while spending time on the White River Apache reservation as a volunteer dentist in Cibeque, Arizona. There, he was overwhelmed with the idea of permanently preserving the incredible and undeniable rich personality of the Native Americans. Early in his career he traveled to South Dakota where he spent time with the Lakota Sioux of the Pine Ridge Reservation, later he traveled to meet with the Navajo in northeast Arizona. His fascination with the Apache, Navajo and Lakota Sioux inspired him to depths of emotion that could only be conveyed with brush and canvas. He painted to capture and share the poignant spirit and innocence of heart combined with the stealth perseverance of dignity that he encountered on the reservations. Collectors praise his landscapes and figurative oil paintings. Most often, they mention the spirit seen in the faces he paints and the powerful emotions they evoke. John's paintings glow with rich yet subtle light, always framing the inner soul and thoughtful expression of his subjects. John's figures inevitably inspire an emotional involvement in the story captured in the brief moment he paints. "The people I paint," John claims, "have such character and dignity, such a joy for living. Their spirits never seem to fade, they are truly eternal." ©2012 John Yaeger Gallery. All Rights Reserved.